Diclofenac sodium is a non-steroid anti-inflammatory drug that reduces pain and swelling. 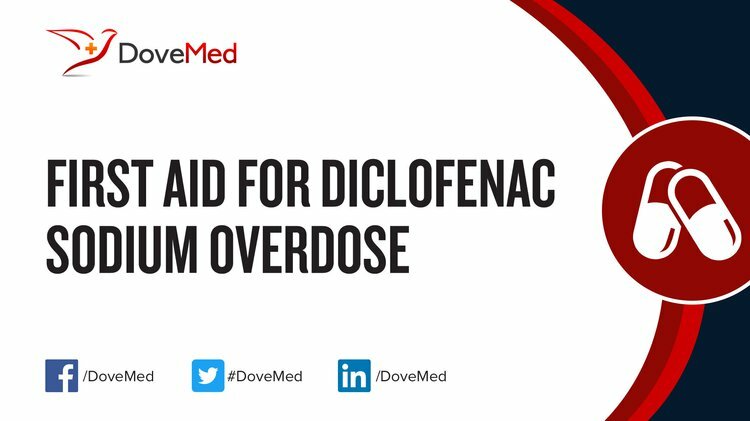 Diclofenac Sodium Overdose is the accidental or intentional intake of the drug in dosage higher than prescribed. What is Diclofenac Sodium Overdose? Diclofenac Sodium Overdose may be also referred to as Voltaren Overdose. What are the Causes of Diclofenac Sodium Overdose? What are the Signs and Symptoms of Diclofenac Sodium Overdose? The signs and symptoms of Diclofenac Sodium Overdose can vary from one individual to another. It may be mild in some and severe in others. Several systems of the body, such as the digestive system, nervous system, vascular system, respiratory system, skin and ENT may be affected. How is First Aid administered for Diclofenac Sodium Overdose? Who should administer First Aid for Diclofenac Sodium Overdose? First aid for Diclofenac Sodium Overdose is administered by healthcare professionals. What is the Prognosis of Diclofenac Sodium Overdose? How can Diclofenac Sodium Overdose be Prevented? Aygün, D., Kaplan, S., Odaci, E., Onger, M. E., & Altunkaynak, M. E. (2012). Toxicity of non-steroidal anti-inflammatory drugs: a review of melatonin and diclofenac sodium association. Histology and histopathology, 27(4), 417. Hunter, L. J., Wood, D. M., & Dargan, P. I. (2011). The patterns of toxicity and management of acute nonsteroidal anti-inflammatory drug (NSAID) overdose. Open access emergency medicine: OAEM, 3, 39. Giri, A., Ghosh, T., Panda, A. B., Pal, S., & Bandyopdhyay, A. (2012). Tailoring carboxymethyl guargum hydrogel with nanosilica for sustained transdermal release of diclofenac sodium. Carbohydrate polymers, 87(2), 1532-1538. Almeida, P., Lopes‐Martins, R. Á. B., Tomazoni, S. S., Albuquerque‐Pontes, G. M., Santos, L. A., Vanin, A. A., ... & Leal‐Junior, E. C. P. (2013). Low‐Level Laser Therapy and Sodium Diclofenac in Acute Inflammatory Response Induced by Skeletal Muscle Trauma: Effects in Muscle Morphology and mRNA Gene Expression of Inflammatory Markers. Photochemistry and photobiology, 89(2), 501-507. Kerr, D. E., & Fletcher, A. K. (2010). Fatal nefopam overdose. Emergency Medicine Journal, emj-2009. Hammad, F. T., & Lubbad, L. (2011). The effect of diclofenac sodium on renal function in reversible unilateral ureteric obstruction. Urological research, 39(5), 351-356. Sultana, N., Arayne, M. S., & Naveed, S. (2010). Simultaneous Quantitation of Captopril and NSAID's in API, Dosage Formulations and Human Serum by RP‐HPLC. Journal of the Chinese Chemical Society, 57(1), 62-67.